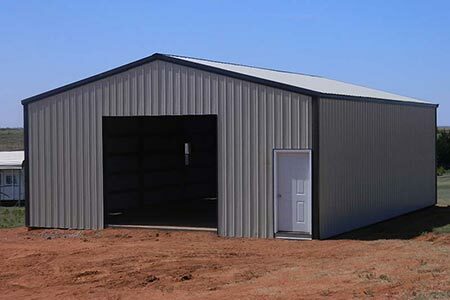 Do you need a barn, workshop, or garage constructed on your Guthrie, OK land? D Cross Barn Co. has the expertise and experience to get your building up quickly and efficiently! D Cross Barn Co. has over 35 years of construction experience and 20 years experience building pole barn structures. Pole barns are wood frame buildings with posts for piers which allow you to build on uneven ground. This means we can construct your barn where you need it most! Pole barn buildings are also sturdy and long-lasting, and they’re able to be designed to your preferences. D Cross Barn Co. offers a myriad of design choices, colors and custom features so the barn can be built exactly how you envision it. Windows, cupolas with weather vanes, insulation, and skylights are just a few of the features you can choose to add! Because our pole barns are constructed with wood posts for piers, not all of them even require a concrete foundation. But, if you prefer a concrete base, or if you desire to have a walkway or driveway near your barn, D Cross Barn Co. can pour the concrete, too. You don’t have to search for another company to do that part of the job! D Cross Barns offers warranties on our buildings and chooses high quality materials for all our construction projects. Let us help you add beauty and charm to your Guthrie, OK, property while providing you with a useful building at the same time! For a free, no-obligation consultation, contact us today at at 1-866-749-7627 or 918-805-7512 or fill out a project quote form on the Contact Us page!